(Newser) – You've made the cut—now cut a check. 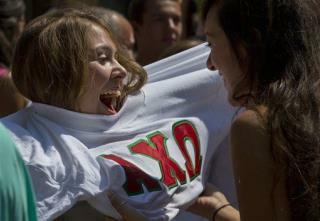 The New York Times today dives into just how much it costs to be in a sorority. The upshot: a lot, and it's a total that frequently isn't conveyed to women swept up in the excitement of rush. The first semester as a sister is usually the most expensive, and sorority girls at the University of Georgia, for example, will find themselves paying $1,570 in Panhellenic dues and a slew of fees (chapter, administrative, nonresident house, initiation). One Georgia State junior says she paid as much as $200 a month on top of her fees in sorority-related expenses, with the Times finding that "Bigs" often spend hundreds on gifts for new members, called "Littles." Next on Newser: Jessica Biel, Justin Timberlake Expecting Baby? My daughter was in a sorority during her 5 years at U of A and I'm not a rich gal, but the benefits were so worth it! The fees paid for housing, 3 meals a day, provided a sisterhood that has lasted 15+ years, they HAD to keep their grades up, and so much more. When I compared the cost of housing, meals, utilities, etc in her freshman year (you couldn't live in the house till sophomore year), Her living expenses were less to be in the sorority. Of course, that was a few years ago, might have a different comparrison by now. I always thought the price was the lose of your individuality, and self respect. I didn't realize that it came with monetary fees as well.